Early modernism to moving contemporary… and lots of fun in between! Earplay, a pillar of the Bay Area’s contemporary music scene, held a concert on Monday March 18 in San Francisco’s ODC Theater, a newly built facility in the Mission with a lively sound. While Herbst is closed for construction, the ODC should be getting lots of play. Their new theater on 17th St and Shotwell, though substantially smaller than Herbst, is a choice location for dance, theater and small ensembles for precisely that reason, with a high and reverberant head, intimate experience and steeply raked seats. Monday’s concert was assembled around two themes: the exploration of self and the suspension of self at the end of life. Three younger composers had their works performed, all West Coast premieres, and each imparted that sense of inner examination through soliloquy. Contrasting with that direct impression of budding ego were three works of waiting and displacement, of the deep space that frames a life. The concert opened with Elliott Carter’s dreamy Elegy for cello and piano, with Thalia Moore building yearning phrases on the cello and Daniela Mineva bracketing them with careful evasions, two or three notes spaced around an invisible chord. It is an imposing work, slippery and lyrical, which Carter wrote in 1939 at the age of 31 and then retooled in 2007 at the age of 99. Now that’s a life in the arts. 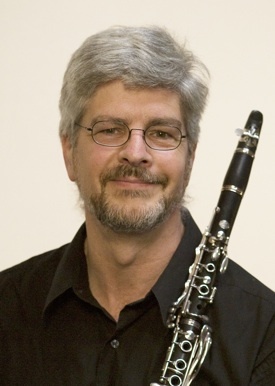 Clarinetist and composer Peter Josheff was invited to compose a piece after Ein Stelldichein (A Rendezvous), a famous fragment by Arnold Schoenberg after a noir turn-of-the-century poem of the same name. Josheff spoke about this before hand with board member and fellow composer Bruce Bennett. First they performed Ein Stelldichein, and Schoenberg’s moody music unfolds with a quality of slow surprise, offering hints of death. As in the Richard Dehmel poem, it is hugely atmospheric. the heavy sky seems to have sunken into the grain. The phrases were slow, with winter’s cool sensuality. Deep piano grumbles, a wither of strings, and an aloof clarinet seeped its way into the center. In Waiting, Josheff used the same instrumentation, and even the same pitches, but to different effect. The clarinet, prominent in the Schoenberg, became a hidden force. “I am moving away from the clarinet as a solo instrument and towards its being more of a chameleon,” Josheff explained. His approach shaped an early twentieth century experiment into a more succinct landscape, still with bits of wide-eyed whole tone scales and exaggerated intervals, but without the tinge of fin-de-siècle decadence. Along with Josheff on clarinet, Denis Harper gave the oboe line concentrated warmth, and Thalia Moore added deeply resonant cello notes—at times she owned the bottom register! Rather than the gravity of Ein Stelldichein, Waiting used short sweet gestures to create its omens and portents. Mineva returned as the pianist, conducting entrances from the bench, and Terrie Baune floated violin notes in and out, with moments of tender cello harmonies and lovely tremolo textures against piano arpeggios. Josheff’s Waiting was composed as he watched his mother slowly weaken, and she passed away a few months later on December 18. Dorothy Cary, to whom the piece is dedicated, was a Wisconsin poet with plainspoken text centered on the simple rhythms of life. I have twice heard her read her poetry against an instrumental setting composed by Peter, and the combination of familial and artistic collaboration was quite moving. Waiting inherits that sense of collaboration, and Josheff described how alternating chords could represent the in-and-out breaths of her harmonica. Mikel Kuehn traveled from Vienna to hear Colored Shadows, which he wrote last year for viola and electronics. Violist Ellen Ruth Rose added serenity to the inward-compelling work, much of which centered on the electronic permutations and decays of her sound. It was cerebral and vaguely Spectralist. Then Josheff appeared in Caprice, a clarinet solo by Tiffany Sevilla. Atonal phrases spaced themselves, connected by a centering on the breath. Josheff made it personal, with slow evolutions and a sense of discovery around the creation of sound. The third composer, Yao Chen, was also on hand for his Sotto Voce, ably executed by flutist Tod Brody and pianist Brenda Tom. Brody’s sharp exclamations and “chuffs” over the heavy-pedaled brooding of a piano left one with the impression that this was more of an exercise than a composition. But though wandering through ghost tones and hissed expletives in an undisciplined terrain, Brody helped it cohere to its own rules. In fact, all three of these pieces worked as well as they did because of the awe-inspiring musicality of the Earplayers, each delivering a magical space and a meaty intent. Photo top of Peter Josheff; photo bottom of the Earplayers, from left: Peter Josheff, cellist Thalia Moore, flutist Tod Brody, violist Ellen Ruth Rose, violinist Terrie Baune, and conductor Mary Chun. Moving works and delicious experiments are the bread and butter of Earplay, which has its next concert on May 20 at 8:00 p.m., pairing Schoenberg’s String Trio with four brand new compositions. See www.earplay.org for more information.